Houston, we have a problem…! The Philippines is now 5th in the world having the worst traffic management system. 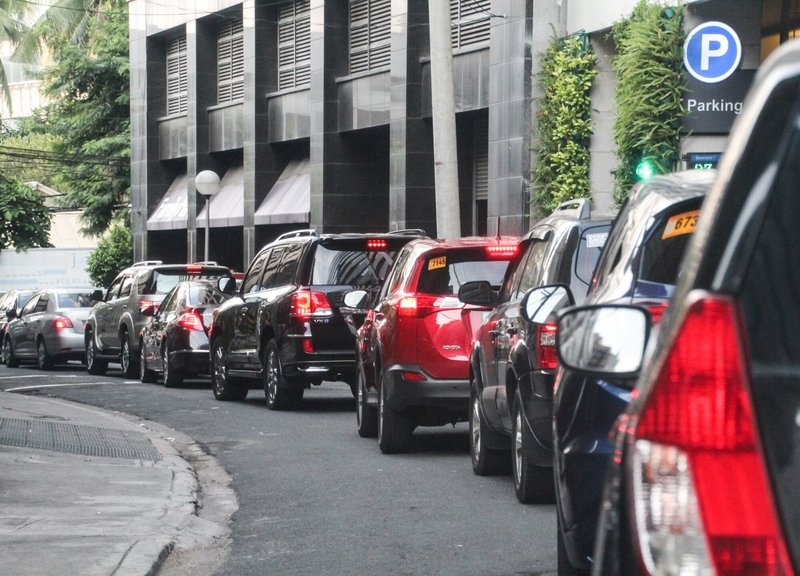 It was reported that about 20,000 new cars are being bought and added to the streets of Metro Manila every month, that’s about quarter of a million each year with no planned road expansion. Our country has a terrible urban planning and traffic enforcement is but a laughing stock where enforcers can be easily bribed with a few hundred pesos, or about $2 to $3. The image I took is not a traffic jam in a street. Believe it or not… it is a looong queue of cars waiting to enter a parking facility. And if you don’t have a reserved parking in the country’s financial district, Makati, it will take you 30 minutes to an hour just to get a parking slot! It is really fun in the Philippines! I’m not collecting stars, I actually want to share my work. Okeyokey! I sold my car for almost two years ago, and bought myself a new bike instead. Same in Baguio although not as bad. The roads are so narrow. I don’t think the Philippines tourism bureau is going to approve of this post. Hahaha! No worries, I have a reserved slot. I only have one word for it… “Aaargh”!